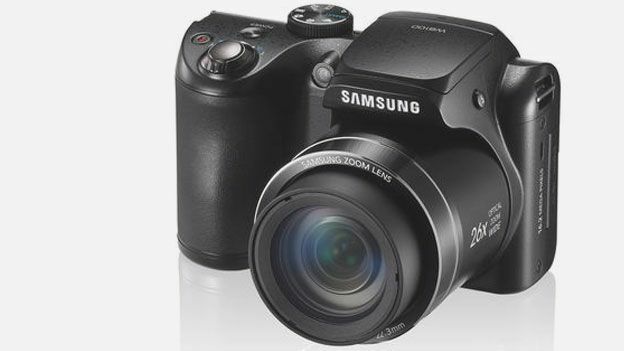 Samsung has announced the WB100, a new addition the company's WB range of bridge cameras, lining up with an impressive 16-megapixel sensor. Tipped to excel as taking wide, holiday-loving landscape shots, Samsung's latest bridge snapper comes paired with 22.3mm ultra wide-angle lens with 26x zoom and F3.1-5.9 aperture settings helping you capture the panorama's full effect. Offering 720p HD video recording capabilities at 30 frames-per-second, image and movie playback is made possible by the WB100's inbuilt 3-inch TFT LCD display whilst 3D photo capture and Live Panorama Modes will help bring your images to life. Counteracting image depleting wobble, the Samsung WB100 feature's Dual Image Stabilisation technologies whilst the camera's ISO range runs from 80-1600, which can be boosted to 3200 if you are willing to shoot at the lower resolution of 3MP. A range of fun image enhancing features are also available, including Smart Filter, Magic Frame and a split shot mode. Set to be made available in red or black colour forms, Samsung has yet to offer any confirmed Samsung WB100 pricing or release date plans. What do you make of the latest bridge snapper to come from the Samsung stable, impressive hit or disappointing miss? Let us know via the T3 Twitter and Facebook feeds.